The ManxGP delivered an astonishing week of racing following a week of disaster, due to Mother Nature doing her utmost to cancel practise sessions and qualifying. Extra preparation paid dividends for those that sacrificed family time and money for additional visits to the island to better improve their chances of a finish or indeed a podium. As a small island nation the results were remarkable but, individually they were heroic in stature. From James Chawkes magnificent Junior Manx Grand Prix win on the Paton, to Thomas Maxwell’s win in the Newcomers race it was truly exceptional. Racing began on the Tuesday with Maxwell’s win in the Newcomers A race and Westmeath’s Paul Fallon finished well up the field in 14th. Later on in the B race, Cork’s Barry Sheehan picked up 3rd place and Skerries Paul O’Rourke was 7th. On Wednesday the momentum continued with a win in the Ultra Lightweight race for Darryl Tweed and a 5th for Nigel Moore. Up next was the first Lightweight Race and Ireland swept the board. Andy Farrell came home in P1 from James Chawke in 2nd and David Lumsden completed the Irish rostrum. Dave Butler wasn’t far off in 4th, Nigel Rea 17th and Tommy Henry 20th. In the afternoon came the Manx Junior GP and we were again astounded when Limerick’s James Chawke was victorious. Andy Farrell took 7th, David Lumsden 8th, Athlone’s Damian Horan 12th, Dave Butler 13th and Thomas Maxwell 16th. Tommt Henry and Nigel Rea also picked up replica trophies for the finish. A well earned break was enjoyed on the Thursday. Senior Manx day began with the second Ultra Lightweight race and Darrly Tweed did the incredible double on the M&D Kawasaki ZXR 400! Not to be outdone in the second Lightweight race, Andy Farrell also secured back to back wins on the Ollie’s Place Supertwin. Dave Butler also improved to step up to the podium in 3rd on the Fingal Motor Club twin. David Lumsden rode home a brilliant 4th place. 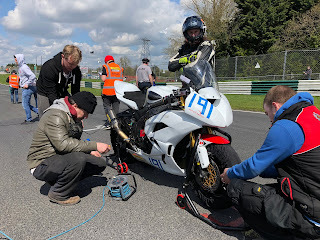 In the Senior race, Cork’s Mike Browne’s response to a catastrophic engine failure during the week was sensational with a 4th place and a 119mph lap. Close behind in 5th again, was Andy Farrell and in 6th on the Carl Roberts ZX6r was Junior ManxGP winner James Chawke. More consistency came from David Lumsden on the Martin Bullock R6 in 7th to earn another replica for his efforts. Replicas were earned by double Ultra Lightweight winner Darryl Tweed, Ryan Maher, Tommy Henry, Nigel Rea and Noel Carroll. Another Irish win went to Team Kells for their fantastic results. Put together by Road Race fanatic Gail Corr, Team Kells consisted of Mike Browne, Paul O’Rourke, Barry Sheehan, Veronika Hankocyova, James Chawke, Dave Butler, Thomas Maxwell, Damian Horan, Paul Fallon and David Lumsden. Huge congratulations to all involved, get well soon to those injured and condolences to those lost while competing.